On 27 Jun 2013, the parliament of Kyrgyzstan adopted a decision to relieve Tursunbek Akun from the post of ombudsman. A special commission identified violations of the ombudsman’s oath as the main human rights advocate. 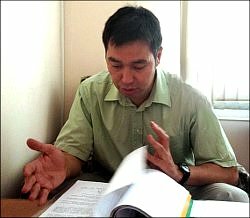 Nurbek Toktakunov, a well-known lawyer with significant experience, is among those competing for the vacant position. Fergana interviewed him on what an ideal ombudsman must be like and what would his first action be, should he be appointed ombudsman. Fergana: What is your evolution of Tursunbek Akun’s activities as the country’s ombudsman? What were his merits and shortcomings? Nurbek Toktakunov: The major merits were, perhaps, those that he had before assuming the post. And shortcomings are, to my mind, rest on the fact that Tursunbek Akun sees himself as a politician: He has recently said he was “in politics for the last 20 years.” Indeed, he does think like one some times. For example, while the discussions on the convection on disabled persons’ rights were underway, Akun said the issue was being raised prematurely because the budget would be unable to shoulder pertaining expenditures. But the budget issues are not his concern: he is a human rights advocate, not a finances ministry official. That is when he started morphing into a politician and thinking about the political feasibility of human rights issues. After said June events, Tursunbek Akun circulated information, which later led to an assault on the famous human rights advocate Aziza Abdurasulova: He kept insisting she was defending Uzbeks only. But the problem was that Uzbeks specifically were indeed subjected to criminal persecution at that time! If those persecuted were Kyrgyz, she would have defended them as well. By the way, Ms. Abdurasulova already defends ethnic Kyrgyz. On 1 Oct 2010, I sued Tursunbek Akun for violating his oath and asked the judge to oblige him to publicly offer his apologies for his false statements about Ms. Abdurasulova. But my lawsuit was not accepted due to the immunity ombudsman enjoys. However, it was an incorrect ruling, since I was not breaching his immunity and did not ask to him criminally liable. In other words, I uncovered the facts of his breach of oath already back then, while the parliament is doing it only now. Fergana: What ideal ombudsman must be like, in your opinion? Nurbek Toktakunov: Ombudsman’s power rests on that very lack of authoritative powers. That is why I decisively opposed against [former ombudsman 2003-2008 and a current MP] Tursunbay Bakir uulu’s success in obtaining the status of a state employee for himself and his staff. The institution of ombudsman is a unique body in the governance system and it is to defend human rights. There are many saying this is a useless position because having identified authorities’ violations, ombudsman is not authorized to adopt decisions in that regard, and can only issue recommendations. But the lack of authoritative powers is not weakness; on the contrary—it is strength. Because any institution is subject to the system’s faults and vices, once it obtains authority and occupies space in the authority hierarchy. Ombudsman’s power is in the fact that he is seemingly outside the authority system and therefore free of its vices. A strong ombudsman is one, whose recommendations are worded and presented in a way that it is impossible to avoid them. While this might look utopic, the power of recommendations does not rest on their implementation, but primarily on their convictive, logical and meaningful nature. The more competently recommendations are written the more true nature will be revealed of that system, which would reject them. There is another important factor: Ombudsman’s staff must fight for restoring and defending the rights of those citizens who appeal with them, not in their stead. The citizens are to be explained about the potential of the national legislation in restoring justice on those issues they are concerned about; they must also be stimulated to independently defend their own rights and protect liberties. It is also necessary to follow-up with the victim using his/her capacity to do so and the government bodies’ reaction to that activity. Doing so would enable making every single case of human rights violation a material for analysis of the state mechanisms for human rights protection: courts, prosecutors and law-enforcement bodies. This analytic material could then be used for improving the system. Fergana: Does Kyrgyzstan have sufficient legal basis for a full-scale activity of ombudsman? Nurbek Toktakunov: The current legislation grants ombudsman the right to immediate meeting with the president, the parliament speaker and other high-ranking officials. In other words, he/she is capable of delivering urgent information. I am not aware when Tursunbek Akun utilized that right. Ombudsman is authorized to be present at all session of the Supreme Court, the parliament, etc. He is also authorized to petition on the official interpretation of laws; to unhindered visits to state bodies, local self-governance and even military units; to request and obtain from state bodies those materials and documents that pertain to issues to be tackled; he has access to information that could be to state and professional secret; to invite officials for written or oral testimonies for tackling complaints filed by citizens; and to visit restricted-access institutions. In a word, ombudsman is granted many powers. He/she needs to be able to competently utilize them and compile significant analytical materials backed up with human rights advocates’ conclusions and recommendations. Fergana: Why did you decide to apply for this position? Nurbek Toktakunov: I was offered to run before Tursunbek Akun was reappointed [on 31 Jan 2013], but I refused because I did not want to assume a government job and I enjoy what I do as a lawyer. However, the situation has changed since then. All the efforts we apply to achieve access to information, to judges, to penitentiaries and data on torture are resulting in very slow progress and much depends on the ombudsman. I believe if a competent and proactive individual assumes this position, he/she would be able to do a lot even in the current political situation in the country, which has no hierarchy, but has competition and innumerable human rights violations. Fergana: What would be your first action as ombudsman? Nurbek Toktakunov: I would start with certification of staff in order to relieve of jobs those who are there only for the “state employee” status; I would leave those who are genuinely interested in defending human rights. I believe many local human rights activists should be working at the ombudsman’s office, while the government must be interested in unconditional respect for human rights. Unfortunately, respecting human rights is presented as something that not we but international organizations are in need of. Fergana: You have been defending Azimjan Askarov for a very long time. Should you be ombudsman, what steps would you take to achieve acquittal and release from prison? Nurbek Toktakunov: The process is underway without the ombudsman’s participation. A complaint was lodged with the UN Committee for Human Rights and communications are underway with them and the Kyrgyz government. Normally considering a case can take anywhere between three to six years. We are hopeful that this complaint would be considered within the next year or two. I am aware that the prosecutor general’s office has sent the exterior ministry its reaction to the complaint. The exterior ministry must hand it over to the UN committee, which is then to send it to us so we can comment on it. Then the issue would be discussed in a session considering all the comments. I believe the recommendations the UN issues are to be implemented, but they have to be achieved first, obviously. If I am appointed ombudsman, I would be able to impact this process. In line with the Kyrgyz legislation, the country’s president, MPs, political and public associations can nominate ombudsman candidates. The nominations are to be presented within the 15 days following the vacancy announcement and to be approved of by the majority of MPs’ votes. However, because of the summer break, the parliament decided to break the law: the vacancy for the ombudsman position will only be announced in September.